Ertz (undisclosed) did not play in Sunday's Pro Bowl, Daniel Gallen of PennLive.com reports. Ertz brought in five of eight targets for 50 yards in the Eagles' 20-14 divisional-round playoff loss to the Saints on Sunday. Ertz caught five of seven targets for 52 yards in Sunday's 16-15 wild-card-round win over Chicago. Analysis: Ertz still wasn't his usual dominant self, but this was a major step forward after he produced only 15 yards in the regular-season finale. 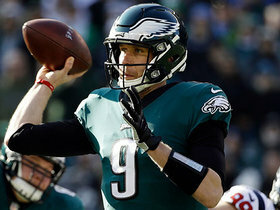 Quarterback Nick Foles spreads the ball around more than Carson Wentz (back) did, so Ertz isn't seeing the same boatload of targets that he was before Wentz went down, but the talented tight end should still be a big part of Philadelphia's divisional-round gameplan in what will likely be a higher-scoring affair against the Saints. Ertz caught three of four targets for 15 yards during Sunday's 24-0 win over the Redskins. Analysis: Ertz merely tied for fourth on the team in targets and didn't do much with the looks he did get, as his long gain went for just seven yards. He's failed to reach 40 receiving yards in three of the last four games, but he still enjoyed an outstanding season overall. Ertz finishes the campaign with 116 catches for 1,163 yards and eight touchdowns -- all of which represent career highs. The star tight end will face a tough matchup in next Sunday's wild-card-round game against the Bears. Ertz caught 12 of 16 passing attempts for 110 yards and two touchdowns in Sunday's 32-30 win over the Texans. Ertz (ankle) practiced in full Thursday, Daniel Gallen of The Harrisburg Patriot-News reports. Analysis: Limited by an ankle injury at Wednesday's session, Ertz handled every rep presented to him one day later, clearing him for his usual high-volume role in the Eagles' passing attack. He has an exploitable matchup Sunday versus a Texans defense that has given up 84 receiving yards per game and four TDs to tight ends over the last six contests. Ertz was a limited practice participant Wednesday due to an ankle injury, Zach Berman of The Philadelphia Inquirer reports. Ertz caught three passes (seven targets) for 22 yards in Sunday's 30-23 win over the Rams. Analysis: Ertz has really struggled over the last two weeks (60 combined receiving yards and no touchdowns) after posting elite numbers through the first 13 weeks of the season. The 28-year-old has still received ample targets (15) during his two-game skid, so this may simply be a cold streak, but it has also come at the worst time for the majority of his fantasy owners. Ertz will look to get back on track against the Texans on Sunday. Ertz caught five passes (eight targets) for 38 yards in Sunday's 29-23 loss to the Cowboys. Ertz caught nine of 10 targets for 83 yards in Monday night's 28-13 win over the Redskins. Analysis: Ertz was his ever-present self in the Eagles passing game, helping the team move the sticks in a variety of ways. 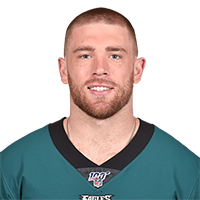 In fact, with his nine catches, Ertz set a new franchise record for receptions in a single season, yet still has four games to improve on his total of 93. He'll look to do so in a big way Week 14 versus the Cowboys, who he already caught 14 passes for 145 yards and two touchdowns against Week 10. Ertz caught seven of eight targets for 91 yards in Sunday's 25-22 win over the Giants. Analysis: Ertz tied the Eagles' single-season record for catches by a tight end with his 81st of the season in the second quarter, finding the end zone from 15 yards out on the play. He went on to shatter that mark as the game went on, bringing his season totals up to 84 catches, 895 yards and six touchdowns. Ertz is putting together one of the greatest tight end campaigns of all time, and his dominance should continue in Week 13 against the Redskins on Monday Night Football. Ertz caught two of three targets for 15 yards during Sunday's 48-7 loss to New Orleans. Analysis: Coming off a monster 14-catch game in Week 10, Ertz laid an egg on Sunday as nothing much went right for the Eagles. The effort snapped a streak of six straight games in which Ertz either topped 100 yards or scored in each contest. A bad showing against what was supposed to be a weak New Orleans pass defense doesn't change that, but he'll face a tougher test next Sunday against a Giants defense that has been middle-of-the-road against the pass, averaging 245 passing yards per game. Ertz hauled in 14 catches (16 targets) for 145 yards and two touchdowns in Sunday's 27-20 loss to Dallas. Ertz caught four of six targets for 26 yards and a touchdown in Sunday's 24-18 win over the Jaguars in London. Analysis: Ertz was kept quiet for most of the game, but he made owners happy with a five-yard touchdown catch in the fourth quarter. He's consistently been among the top performers at the tight end position, but owners will have to look elsewhere in Week 9 with the Eagles on bye. Ertz caught nine of 11 targets for 138 yards during Sunday's 21-17 loss to the Panthers. Analysis: Ertz led the team in targets, catches and receiving yardage as he recorded his highest output in that category since the 2016 season. He wasn't able to extend his touchdown streak to three games, but he's now gone over 100 yards receiving in three of the last four games and is on pace for over 1,400 for the season. Ertz will look to continue his recent success next Sunday against the Jaguars. 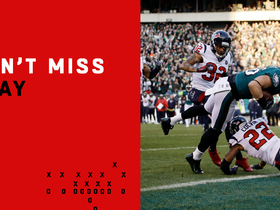 Ertz hauled in seven of nine targets for 43 yards and a touchdown in the Eagles' 34-13 win over the Giants on Thursday. Ertz caught 10 of 11 pass attempts for 110 yards and a touchdown during Sunday's 23-21 loss to the Vikings. Ertz caught 10 of his 14 targets for 112 yards during Sunday's 26-23 loss to the Titans. Analysis: All eyes were on the return of Alshon Jeffery, but Ertz still ended up leading the Eagles with 14 targets. Just two of those targets were inside the red zone, however, and none came inside the 10-yard line. Ertz, who has seen at least 10 targets in every game this season, is about as reliable as tight ends come, but he has yet to find the end zone this season. His next shot will be Sunday against a struggling Vikings defense. Ertz snagged five of 10 targets for 73 yards during Sunday's 20-16 win over the Colts. Ertz brought in 11 of 13 passes for 94 yards in the Eagles' 27-21 loss to the Buccaneers on Sunday. Ertz brought in five of 10 targets for 48 yards in the Eagles' 18-12 win over the Falcons on Thursday. Ertz caught four pass attempts for 26 yards in Thursday's preseason loss to the Browns. Analysis: Ertz saw five targets in all out of Nick Foles' 17 pass attempts and now has 46 yards on five catches in his two preseason games. Additionally, the 27-year-old is one of the few healthy pass-catching options on the team at the moment. The six-year veteran is poised once again to be a top-flight tight end this season. Ertz (undisclosed) returned to practice Tuesday, Eliot Shorr-Parks of NJ.com reports. Analysis: Despite missing just three days of practice, Ertz may be held out of the preseason opener Thursday against Pittsburgh, as the likely absence of both Carson Wentz (knee) and Nick Foles (upper body) could encourage the Eagles to wait until the second week of the preseason to take a look at their first-string offense. Ertz was productive while playing with both quarterbacks last season, averaging 5.2 catches in 11 games with Wentz and 5.8 catches in six games (including playoffs) with Foles. Ertz (undisclosed) didn't practice for the third straight day Monday, Jeff McLane of The Philadelphia Inquirer reports. Analysis: The tight end's absence isn't expected to be an extended one, with Ertz's current string of missed on-field work being attributed to maintenance. Moreover, the Eagles are of a mind to proceed judiciously with Ertz, with an eye toward the long season ahead. Ertz will not practice Sunday, Eliot Shorr-Parks of NJ.com reports. Analysis: Ertz also sat out of practice Friday, when head coach Doug Pederson said the tight end was getting a veteran's day off. With no mention of an injury since, Ertz's absence on Sunday is likely for rest purposes as well. With fellow tight end Richard Rodgers (upper body) not on the field either, second-round rookie Dallas Goedert should get plenty of reps with the first-team offense Sunday. Ertz has restructured his contract with the Eagles, an agreement that will create $5.047 million in salary cap space for the team, the Philadelphia Inquirer reports. Ertz brought in seven of nine targets for 67 yards and a touchdown during the Eagles' 41-33 win over the Patriots in Super Bowl LII on Sunday. Ertz caught all eight of his targets for 93 yards in Sunday's 38-7 NFC championship win over the Vikings. Analysis: Ertz led his team in both catches and receiving yards, consistently causing matchup nightmares for the talented Vikings defense. Quarterback NIck Foles was brilliant when targeting Ertz and Alshon Jeffery, as the pair of big-bodied weapons caught all 13 balls thrown their way for a combined 178 yards and two touchdowns. Even if the Patriots get Rob Gronkowski back from a concussion, Ertz could easily finish as the top receiving tight end for either side in the Super Bowl. Ertz caught three of five targets for 32 yards during Saturday's 15-10 win over the Falcons. 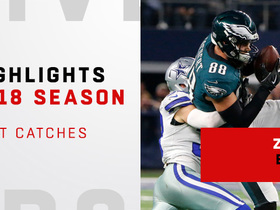 Ertz's head coach, Doug Pederson, said some of the Eagles' key players won't play all of Sunday's game against the Cowboys, ESPN.com's Tim McManus reports. Analysis: Ertz obviously falls into that category, along with Nick Foles, Alshon Jeffery, Jay Ajayi and Nelson Agholor. Pederson doesn't seem inclined to hold any healthy players out entirely, but it won't come as any surprise if Ertz is limited to a first-quarter cameo. A full half is probably the best that can be hoped for. Ertz caught nine of 14 targets for 81 yards in Monday night's 19-10 win over the Raiders. Analysis: Ertz was quarterback Nick Foles' security blanket, as he was targeted at least twice as often as any other teammate. That many looks allowed Ertz to post his second-highest catch total this season. Monday's win saw the Eagles clinch the top seed in the NFC, so it'll be worthwhile to monitor how players like Ertz will be handled in Week 17, but he's clearly a comforting presence for Foles in the passing game. Ertz snagged six of nine targets for 56 yards and a touchdown during Sunday's 34-29 win over the Giants. Ertz (concussion) practiced in full Wednesday. Analysis: Injuries have plagued Ertz during the second half of the season, forcing two absences and only one outing with more than 25 yards in five chances to suit up. Earlier Wednesday, he received clearance from the concussion protocol and will thus begin preparation for Sunday's road matchup with the Giants, who he torched for eight catches, 55 yards and one touchdown Week 3. Ertz was cleared from the league's concussion protocol Wednesday, Jeff McLane of The Philadelphia Inquirer reports. Ertz (concussion) is listed as inactive for Sunday's road matchup with the Rams, Dave Zangaro of NBC Sports Philadelphia reports. Analysis: Medical clearance from an independent neurologist seemingly came too late for Ertz to make an appearance this week. He'll thus turn his focus to a divisional game against the Giants next Sunday. In his stead, Brent Celek and Trey Burton will man tight end for the Eagles. 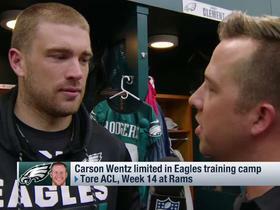 Ertz (concussion) has been medically cleared, but the Eagles are still uncertain whether he will be able to play Sunday against the Rams, Jay Glazer reported on Fox's pregame show. Analysis: The Eagles plan to test out Ertz before the game and cautioned that earlier reports that Ertz was doubtful to suit up may have been premature. According to Les Bowen of The Philadelphia Inquirer, Ertz is still experiencing a dull headache, which has prevented the Eagles from formally signing off on his return. It's likely that Ertz's status won't be decided until 90 minutes before the 4:25 p.m. EST kickoff, making the tight end a risky fantasy roll this week. Ertz (concussion) will be evaluated before Sunday's game against the Rams, but is considered doubtful, per a source, Adam Schefter of ESPN reports. Analysis: Ertz participated in practices Thursday and Friday, but remains in the NFL's concussion protocol and is officially listed as questionable. Brent Celek and Trey Burton would be the main beneficiaries of Ertz's possible absence. Head coach Doug Pederson said Friday that Ertz remains in the concussion protocol, Dave Zangaro of NBC Sports Philadelphia reports. As a result, Ertz is listed as questionable for Sunday's game against the Rams, per Zangaro. Analysis: For the second day in a row, Ertz participated in practice, including individual drills Friday, according to Martin Frank of The Delaware News Journal. In the aftermath of Thursday's faux pas about his standing in the protocol, though, Ertz's situation is murky heading into the weekend. 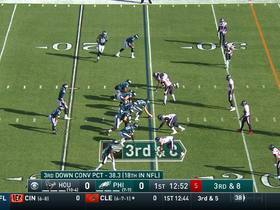 Sunday's 4:25 p.m. EST kickoff isn't exactly appealing for roster management, but Trey Burton and (to a lesser extent) Brent Celek are capable of modest performances when pressed into duty at tight end. The Eagles clarified Thursday that Ertz was cleared to practice but remains in the concussion protocol. Analysis: Erroneously, the Eagles relayed Ertz escaped the protocol in the midst of the aforementioned session, which he kicked off with stretching. To raise the stakes, he was wearing a helmet as well, so signs pointed to a quicker than expected recovery. Upon the release of the injury report, though, he was listed as limited, and clarification about his standing in the protocol soon followed. In order to play Sunday against the Rams, Ertz still must receive clearance from an independent neurologist. Ertz (concussion) was limited in practice Thursday. Analysis: Earlier Thursday, an independent neurologist gave Ertz the all-clear from the concussion that knocked him out of Sunday's loss at Seattle, according to Zach Berman of The Philadelphia Inquirer. Despite the "clean" bill of health, he's seemingly avoiding unnecessary exertion with Sunday's showdown with the Rams in mind. Friday's injury report will give a better indication of his potential to play this weekend. Ertz (concussion) cleared the concussion protocol Thursday, Zach Berman of The Philadelphia Inquirer reports. Analysis: Donning a helmet, Ertz took part in stretches during the portion of practice open to the media, according to Martin Frank of The Delaware News Journal. Shortly thereafter, it was announced Ertz was out of the protocol altogether. His level of participation Thursday isn't known, but he appears on pace to suit up for Sunday's road matchup with the Rams. Ertz (concussion) isn't practicing Wednesday, Jeff McLane of The Philadelphia Inquirer reports. Eagles head coach Doug Pederson said Wednesday that Ertz remains in the concussion protocol but can attend team meetings, Les Bowen of the Philadelphia Daily News reports. Analysis: Knocked out of Sunday's loss to Seattle in the third quarter, Ertz likely hasn't reached his baseline marker in the protocol, which would allow for some activity in practice. Wednesday's injury report will reveal whether he was able to participate in any capacity, but he's not looking good for an appearance in Sunday's road matchup with the Rams. Ertz's absence would result in Brent Celek and Trey Burton splitting the reps at tight end. Ertz is in the concussion protocol, Jeff McLane of The Philadelphia Inquirer reports. Ertz (head) has been ruled out for the remainder of Sunday's game against the Seahawks. Analysis: The Eagles haven't released an official diagnosis, but Ertz is presumably under the league's concussion protocol. In his absence, Philadelphia will need to make due with a combination of Brent Celek and Trey Burton at tight end. Ertz left Sunday's game against the Seahawks in the third quarter to be evaluated for a head injury, Jeff McLane of The Philadelphia Inquirer reports. Analysis: Ertz landed awkwardly while trying to catch a third-down pass from Carson Wentz in tight coverage. The tight end was down on the field for a couple minutes before walking off to the locker room under his own power. Ertz is officially considered questionable to return, but his reaction he's unlikely to pass a concussion test. Ertz caught 10 of 12 targets for 103 yards and a touchdown in Sunday's 31-3 win over the Bears. 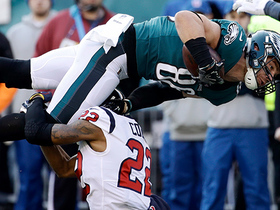 Ertz caught two of five pass attempts for eight yards in Sunday's 37-9 win over the Cowboys. Analysis: Coming off a two-week absence due to a hamstring injury, Ertz played 60 of 64 snaps on offense. 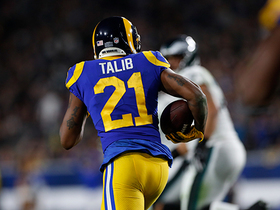 With the Eagles gaining 215 yards on the ground, the 27-year-old turned in his worst statistical performance of the season and broke a string of four consecutive games with a touchdown in the process. He will try to find the end zone again in a Week 12 tilt with Chicago, a team that has been tough against tight ends this season. Ertz (hamstring) doesn't carry an injury designation on the Eagles' final injury report for Sunday's contest in Dallas. Analysis: Ertz was surprisingly held out for a Week 9 win over the Broncos, but a bye gave him more than enough time to heal up. He was a full practice participant throughout the week and can safely be returned to all lineups. Ertz (hamstring) practiced fully Wednesday. Ertz (hamstring) said Wednesday that his injured hamstring "felt good" during his practice session Monday and his workout Tuesday, Zach Berman of The Philadelphia Inquirer reports. Ertz (hamstring) said he was a full go at Monday's practice, but he wasn't ready to commit to playing in Sunday's game against the Cowboys, Eliot Shorr-Parks of NJ.com reports. Analysis: Coming out of a Week 10 bye, Ertz will firmly be on track for a return if he's listed as a full practice participant when the Eagles release their first injury report Wednesday. His inactive status in Week 9 against the Broncos was a major surprise, as Eagles coach Doug Pederson had said that the tight end would play. Ertz seemingly injured his hamstring at practice either Nov. 1 or 2. Ertz (hamstring) is listed as inactive Sunday against the Broncos, Adam Schefter of ESPN reports. Analysis: Despite a declaration from head coach Doug Pederson that Ertz would suit up, the tight end didn't look good in pregame warmups, spurring the last-minute decision. With caution ruling the day, the Eagles will turn to Brent Celek and Trey Burton to man the tight end spot in Week 9. Ertz (hamstring) is listed as questionable for Sunday's game against the Broncos. Analysis: According to Dave Zangaro of NBC Sports Philadelphia, Eagles head coach Doug Pederson said that Ertz will play Sunday, but the Eagles opted to list him on their injury report anyway, despite the tight end's participation in practice Friday. Unless Ertz's hamstring acts up over the weekend and presents issues for him in pregame warmups, he'll take the field and represent one of the top fantasy options at tight end in Week 9. Ertz has recorded a touchdown in each of the Eagles' last four contests. Ertz (hamstring) has been cleared for Sunday's game against the Broncos, Dave Zangaro of NBC Sports Philadelphia reports. Analysis: Ertz was added to the Thursday injury report as a limited participant, but his injury apparently isn't serious enough to warrant a 'questionable' designation for Sunday's game. He'll take aim at a Denver defense that's allowed opposing tight ends to average 6.0 catches for 77.6 yards and 0.6 touchdowns, with a 67.7 percent catch rate and 8.8 yards per target. Running backs and wide receivers have been far less successful against Von Miller and Co.
Ertz was limited at Thursday's practice due to a hamstring injury. Analysis: Ertz was absent from the Eagles' first Week 9 injury report, so his addition Thursday could indicate a number of things. The most frightening would be a practice-related injury, but the team may also be giving him some rest due to the wear and tear that accompanies a typical NFL campaign. His listing Friday will forecast whether there's a chance he's among the Eagles' inactives Sunday against the Broncos. NFL Network's James Palmer talks to Philadelphia Eagles tight end Zach Ertz about how the Eagles will defend their Super Bowl Trophy this upcoming season. Watch Philadelphia Eagles tight end Zach Ertz's best catches in the 2018 season. Philadelphia Eagles tight end Zach Ertz barrels into the end zone on 23-yard catch-and-run touchdown. 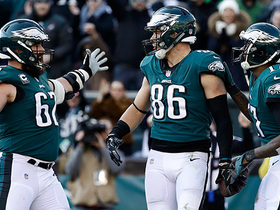 Watch every catch from Philadelphia Eagles tight end Zach Ertz's 110-yard, 2 touchdown day in Week 16. 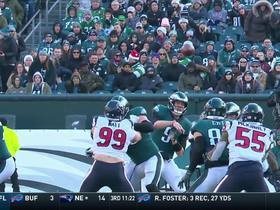 Philadelphia Eagles quarterback Nick Foles comes up clutch on lofting pass to tight end Zach Ertz. 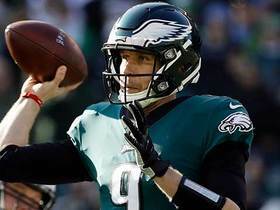 Philadelphia Eagles quarterback Nick Foles delivers 1-yard touchdown to tight end Zach Ertz. Philadelphia Eagles quarterback Nick Foles finds diving tight end Zach Ertz for third-down conversion.